Important Historical Facts And Updates About Measles In Oregon & U.S. If you’re a fan of informed consent, medical freedom, and parental rights, headlines like the one above that hit late last night are music to your ears. Oregon and Washington, the two states out of the blocks first with mandatory vaccination laws, watched as those laws belly-flopped deep into the blue waters of the Pacific yesterday afternoon. Dr. Bates is also known to “space out” vaccines for his own patients and to work with families to create vaccine schedules that are right for them, according to some of his patients. Dr. Bates was one of the public faces and advocates of SB442. He publicly declared that he heard parents saying that they don’t want the state to dictate their medical choices, and he stepped away from the bill. 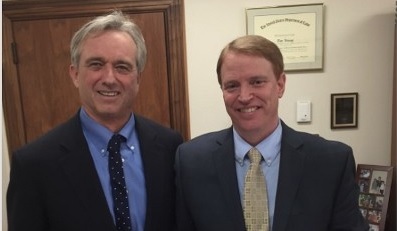 Senator Knopp’s picture, standing with Robert F. Kennedy, Jr., is worth a thousand words. 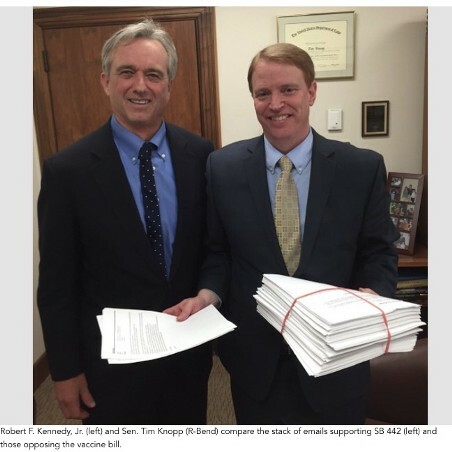 In his left hand, he holds copies of more than 600 emails from constituents opposing SB442. In his right, the emails supporting the legislation. There continues to be strong opposition from parents, especially moms. Maybe 98 percent of email I get is opposed to eliminating parental rights and informed consent as it relates to childhood vaccines. Senator Chris Edwards is one of the younger members of the Oregon Senate and one of the few members with school-aged children. Senator Edwards also sits on the Oregon Commission on Autism Spectrum Disorder and has a child impacted by Autism. Senator Edwards was one of the few Democratic Senators to attend the screening of a movie called “Trace Amounts” last week at the invitation of Robert F. Kennedy, Jr.
It’s our understanding that he was an outspoken “No” vote on SB442, although our sources of confirmation are second-hand. Four Senators. Two Democrats, two Republicans. Reasoned. Open. Responsible. The Senator who, in this extraordinary YouTube clip, blew up at a citizen who challenged her personal willingness to go against the advice of her primary care physician while working to develop a bill that would strip that right from parents. State Sen. Elizabeth Steiner Hayward (D-Portland/Beaverton) introduced legislation last week to end the choice to opt out. She says she’s willing to buck her wealthy constituents. How did Senator Steiner Hayward handle last night’s implosion of a bill she had loudly and boldly sponsored on every news outlet in the country? Did she strike the same responsible tone of co-sponsor Dr. Alan Bates and acknowledge the rightful concerns of her constituents and the parents of Oregon? Let’s contrast Senator Steiner Hayward and Senator Alan Bates. Senator Bates made it clear that he heard the people loud and clear. Senator Steiner Hayward made it abundantly clear that the only reason—and there is only one reason—that she pulled SB442 is because she didn’t have the votes to get it passed. Listen to constituents? No. Change of heart about trampling on the basic tenants of parental rights and informed consent? No. Satisfied that Oregon actually has high immunization rates? No. She didn’t have the votes, period. Steiner Hayward said this new idea addresses the main concerns of SB 442’s opponents, which were parental authority and informed consent. She said videos were not an effective tool for informed consent, which is why she wants to do away with them. Before dismantling Senator Steiner Hayward’s new proposals, we’d like to stop and make a point. To the opponents of SB442, Senator Steiner Hayward is a classic schoolyard bully. Dismissive. Condescending. Arrogant. She invokes her understanding of “science” as being superior despite the fact that the opposition to her is filled with college grads, M.D.s, and Ph.Ds., many of who have spent years studying vaccines. It feels personal, as if she is somehow offended that everyone isn’t bowing down at the feet of her medical expertise. Senator Steiner Hayward, it’s rumored, couldn’t even muster enough votes within the Senate Health Committee, much less the Senate, to get her over-reaching forced vaccination bill passed. And, yet, as she has stated, it only didn’t pass because the debate didn’t go the way it should have? It’s our supposition—confirmed with background conversations—that Senator Steiner Hayward’s personal style is grating on some of her own legislators. How excited are they to have her bring this “vocal minority” back into the Capitol as she heaps more attention on herself by sponsoring yet another vaccine-oriented law? 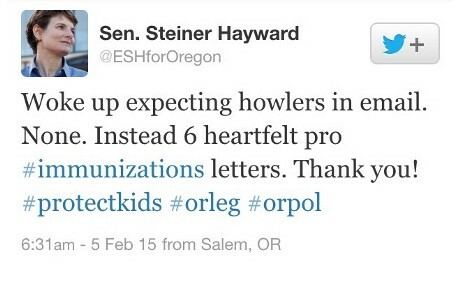 If you want to pass a bill in Salem related to vaccinations, Senator Steiner Hayward is the worst possible spokesperson. Give us something that Bates, Edwards, Knopp, and Kruse all endorse, and it will likely sail right through the Capitol. Here’s the truth, and we’re not trying to be snarky: we don’t trust Senator Steiner Hayward—we know her end game! She wanted to pass a law to mandate all vaccines to all children, which we think is incredibly dangerous. Senator Alan Bates cares every bit as much about children as Senator Steiner Hayward, but we TRUST him. He was honest with us about why he bailed on SB442. NACCHO acknowledges that there are states that may not be in a position to eliminate personal belief exemptions immediately. States that easily permit personal belief exemptions to immunizations have significantly higher rates of exemption than states that have more complex procedures. These states should begin a process to limit the availability of personal belief exemptions to the greatest degree possible. An initial step might be to review the process of applying for and receiving exemptions: the more educational and demanding the process, the lower will be the rate of exemptions. There should be more involved in the application process than simply signing a form. Sound familiar? How do you trust someone when you so fundamentally disagree with their end game? Who cried wolf in Oregon? But what does that 7 percent actually mean? First of all, it does not mean that 7 percent of Oregon’s kindergarteners are not vaccinated. It does mean, however, that they have been opted out from at least one vaccine. Many parents who have nonmedical exemptions from school shots are selective about vaccines. They don’t commonly reject all vaccines. Importantly, the TV module rule governing exemptions that came into effect in 2014 has YET to be evaluated, because OHA has yet to release 2014 data on exemption rates. Senator Steiner Hayward—a denizen of good science—lacks any data on the module’s efficacy and mystifyingly has pronounced that a handful of unattributed anecdotes have proven the current system is broken! We share Senator Steiner Hayward’s belief that informed consent is of primary concern for any medical procedure, including vaccinations. Steiner Hayward said this new idea addresses the main concerns of SB 442’s opponents, which were parental authority and informed consent. “a process for getting permission before conducting a healthcare intervention on a person. A health care provider may ask a patient to consent to receive therapy before providing it, or a clinical researcher may ask a research participant before enrolling that person into a clinical trial. Informed consent is collected according to guidelines from the fields of medical ethics and research ethics. Facts. Implications. Consequences. We are all for that, so we share Senator Steiner Hayward’s view that informed consent is critical to a responsible vaccination system. In order to protect parent rights, the bill must also state that the Doctor providing the consult MUST provide their signature to the form, no matter what decision the parents actually make, once the consult has taken place. If the Doctor is given the discretion to sign or not sign the form, it’s simply a state mandate and we are back to square one. The vaccine schedule put out by the federal Centers for Disease Control and Prevention, Phillips said, is “meant for the herd. It’s not about individual health or well-being.” Some kids have allergies that vaccines may exacerbate, he said, while others would be fine with fewer shots or getting them later in life. What if there are vulnerable sub-populations of children who are biologically unsuited for vaccination? The way to find out is with Oregon’s own data, from the ALERT system built up by the Oregon Immunization Program. It’s arguably the best state-level data in the country, and Oregonians could put it to great use to get some answers about vaccine injury and neurological outcomes that is sorely missing from the debate. Until this debate is settled, the noise from “howlers” will only get louder. 2. Who decides the schedule? Information that has arisen during this debate showed that Oregon has adopted vaccines and made them mandatory for school attendance that aren’t mandatory in other states, like the Hepatitis A vaccine. Who is in charge of adding shots to the schedule in Oregon? How are those decisions made? Why did we adopt Hepatitis A when less than 20 states have? Why is Hepatitis B mandatory when no other countries make it so? Why do we give 4–7 shots at one time when Senator Bates spaces shots out for his patients? Dr. Paul Thomas, a Portland-based pediatrician, claims that he has 1,500 children in his pediatric practice who never received the Hepatitis B shot and had the MMR shot delayed until they were older (age 3). Based on an Autism rate of 1 in 68, 22 children in this group should have Autism. He claims there are zero cases of Autism and he thinks a modified vaccination schedule is the reason. What an extraordinary claim! 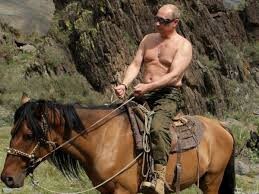 Shouldn’t Oregon investigate the veracity of his claim? 3. What does informed consent with vaccinations really look like? Building on the comments above by Senator Steiner Hayward, how about we lead the nation in establishing TRUE informed consent where parents are given information about benefits AND risks of vaccines? Oregon has a great opportunity to lead from the front. We hope Senator Steiner Hayward, and the rest of the legislature, will find a way out. Shooting from the hip with tack-on legislation to a defeated bill seems like a bad way to start. 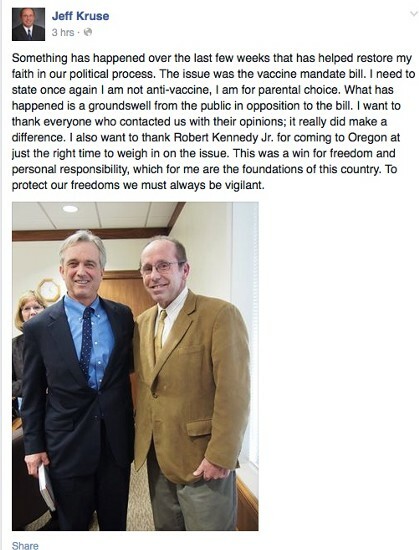 Part 3: What’s NACCHO got to do with Oregon’s vaccine exemption fight? Part 4: Exemption-gate in Oregon? A Glimpse Into The Mindset of The True Believers!